“Perilous Position of HMS ‘Terror’, Captain Back, in the Arctic Regions in the Summer of 1837" by William Smyth R.N. An arctic research mission claims that it’s discovered the HMS Terror, one of two Franklin Expedition ships that sunk during a doomed attempt to traverse the Northwest Passage. Incredibly, the 168-year-old wreck would probably not have been found if it weren’t for information provided by an indigenous crew member. As reported in the The Guardian, the Arctic Research Foundation discovered the HMS Terror in Nunavut Bay. “Resting proud on 24 metres [78 feet] of water, we found HMS Terror—203 years old, it is perfectly preserved in the frigid waters of the Northwest Passage,” noted Arctic Research Foundation spokesperson Adrian Schimnowski. Underwater footage shows the ship in excellent condition, with all three masts still standing and nearly all hatches closed. A pair of wine bottles, tables, a desk (with its drawers open), and empty shelving were seen inside the wreck. The ship was abandoned in sea ice in 1848 during a failed attempt to find the Northwest Passage from the Atlantic Ocean to Asia. All 129 crew members were lost, nearly three years after the Franklin Expedition set out from England. Two years ago, it’s companion ship, the HMS Erebus, was discovered by underwater archaeologists from Parks Canada. Inuit oral history helped researchers narrow its location. The HMS Terror was finally located 60 miles (96 kilometers) south of where archaeologists thought it had been lost. Finding nothing, the Martin Bergmann-led crew decided to take a detour to Terror Bay after hearing a story from an indigenous crew member named Sammy Kogvik. He told the crew that he noticed a large piece of wood sticking out of the Terror Bay’s sea ice while on a fishing trip several years ago, and that it resembled a ship’s mast. It turned out to be one hell of a tip. 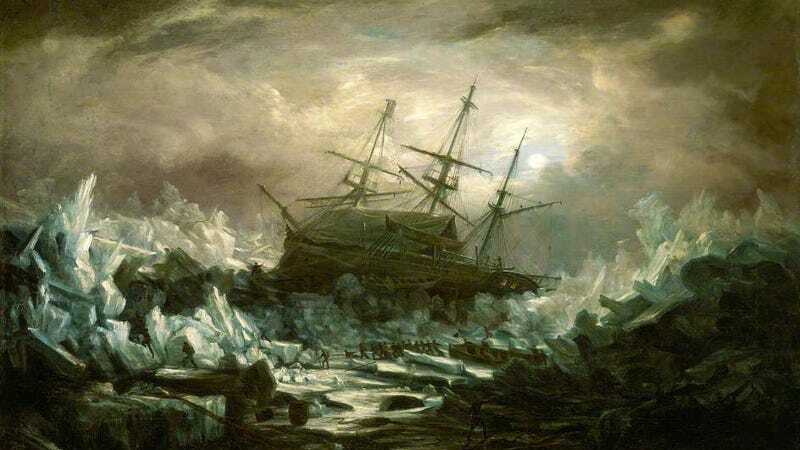 The archaeologists had assumed that the HMS Terror was trapped in ice somewhere between King William Island and Victoria Island, but its location much further to the south is altering our understanding of what happened during the doomed mission. Now that both Franklin Expedition ships have been found, there’s still one lingering mystery: the final resting place of Sir John Franklin himself. And once again, it’s here where oral tradition can help; legend has it that Franklin was buried in a vault somewhere on northern King William Island. Probably a good place to start.